We all know the internet pretty well, don't we? You don't need any qualifications to use it, but if you could get one would you attempt to get one? If your answer is yes, Your next qualification may not have to come from a university but by Google themselves. The tech giant has begun offering an exam aimed at mobile site developers with its brand new certification program, which tests some skills including how to improve site speeds, best practices in mobile UX design, and progressive web apps. The new certificate joins similar exams for AdWords (6 exams) and Analytics in Google’s Partner program. I've completed all seven exams and will be keen to add an 8th very soon. The point of the exam (or rather, the point of acing the exam), is to prove to potential employers that you have “a demonstrated ability to build and optimise high-quality sites, and [it] allows you to promote yourself as a Google accredited mobile site developer.” And, as the tech company points out since most site visitors will leave a mobile page if it takes more than three seconds to load, it’s well worth it to ensure that things are as efficient as possible on small screens. Google's main aim with this new exam is to drive mobile improvement among developers with the average load time for a mobile landing page is 22 seconds, Google points out. That Google’s mobile development exam isn’t focused in particular on any operating system (like Android or iOS). It does, however, have some content around Google’s Accelerated Mobile Pages project (which you may know better as AMP). In any case, this is one certification that may be worth checking out. The new certification program is aimed at agencies, and mobile site developers and exams cover everything from the basics of why mobile sites matter to how to improve mobile site speed, effective mobile UX design and more advanced topics like progressive web apps. As Google notes, passing the exam is meant to show that you have “a demonstrated ability to build and optimise high-quality sites, and allows you to promote yourself as a Google accredited mobile site developer.” A lot of the content in the study guide focuses on site speed. As Google notes, the majority of mobile site visitors will leave a site if it takes more than three seconds to load, yet the average load time for a mobile landing page is 22 seconds (and if those users leave without ever fully loading the site, they aren’t likely to click on any Google ads either, of course). The exam will test you across the four study guide modules available. It’s also worth a mention that the exam doesn’t focus on Android, iOS or any other mobile operating system, though it does cover Google’s own Accelerated Mobile Pages project (and even though that’s a Google project, others are starting to support it). You will have 90 minutes to answer 65% questions, and 80% gets you a passing grade. 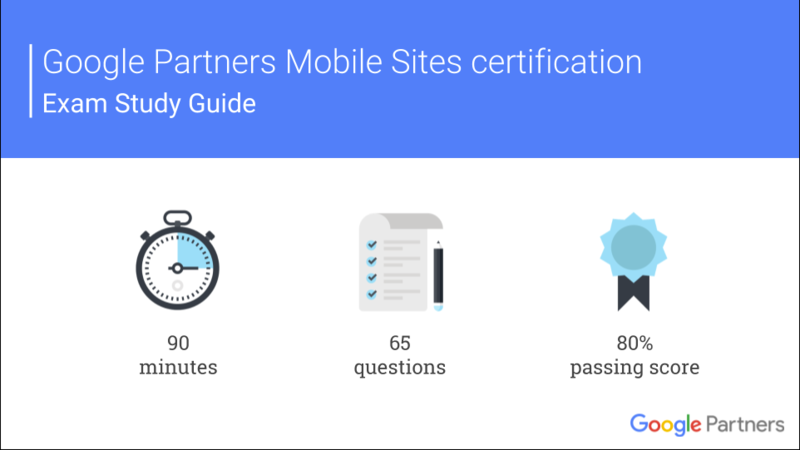 Want to take the first step to gain the Mobile Sites certification? Check out this study guide so that you can study up before you take the exam and demonstrate that you have strong expertise in the requirements for building high-quality mobile sites.